Spring is all about spending time with friends and family while surrounded by great food and fabulous music. No one knows this better than Austin (we&apos;ve kind of mastered the whole patio scene). What better way to celebrate the season than a fresh-air feast with your favorite people? Takoba: Bringing fresh flavors from rural Mexico to Austin, Takoba serves up lunch, brunch and dinner menus loaded with traditional dishes like queso fundido, Baja ceviche, tacos al pastor and chilaquiles. Selections combine locally sourced fare with chiles, beans and herbs imported from Mexico. Sip authentic cocktails and dine on the patio or pull up an Adirondack chair in the sandbox of Takoba&apos;s Cantina El Milamores. The chic restaurant boasts Austin&apos;s largest mezcal selection and offers an extensive list of Mexican and Latin American beers. La Barbecue: They have perfected the art of smoking barbecue, luring hungry locals and visitors with buttery, melt-in-your-mouth brisket, ribs, pulled pork and famous Texas hot guts sausage, sided with chipotle slaw and beans and classic onion, pickles and white bread. The line starts moving when the popular barbecue trailer opens at 11 a.m. and doesn&apos;t let up until they sell out for the day, which happens fast, so get there early. Grab a picnic table seat next to fellow barbecue aficionados and groove to live tunes on the weekends. Easy Tiger Bake Shop & Beer Garden: Walk through Easy Tiger&apos;s bar and bakery area to the back beer garden where you&apos;ll find ping-pong, picnic tables and groups happily chattering over cold beers. This East Sixth Street eatery focuses on sausage, cheese, bread and beer - the four major hangout food groups. The bake shop opens at 7 a.m. and the beer garden welcomes guests from 11 a.m. to 2 a.m. Dip to-die-for soft pretzels in homemade beer cheese, smoked gouda, house made mustard or salted whipped butter and wash it down with craft beer or a specialty cocktail like the Courtney Love made with Tito&apos;s vodka, vermouth, olive juice, lemon and served with blue cheese olives. 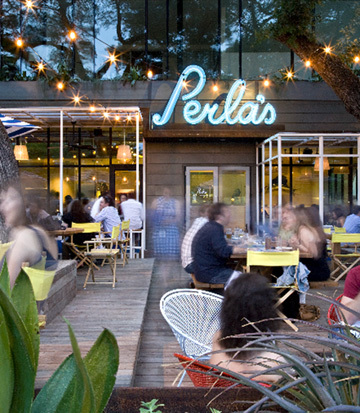 Perla&apos;s: A must for any seafood fan, Perla&apos;s airy wooden deck emits a trendy, beachy ambiance that almost feels like visiting a friend&apos;s Nantucket beach house. The South Congress seafood and oyster bar is crisp and brightly colored with a relaxed vibe that invites you to stay awhile, have another glass of chardonnay and enjoy a long lunch, brunch or dinner. 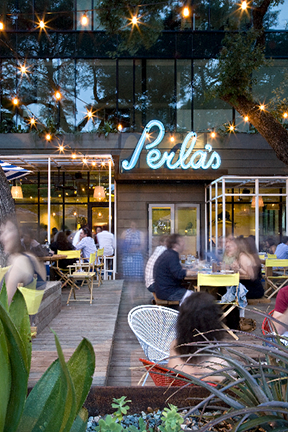 Perla&apos;s features fresh oysters from Washington to Prince Edward Island and appetizers like ahi tuna tartar with quail egg, crab cakes and New Orleans-style BBQ shrimp. Main courses include swordfish and Texas Gulf prawns, while non-fish-eaters can cut into huge prime steaks. Griddle cakes and cheddar and green onion grits made with lobster stock tempt as sharable sides. Start with some cheese curds or boiled peanuts and move on to gourmet sausages spanning traditional to exotic. Favorites include the super loaded chili cheese dog, the Louisiana Lightning pork Cajun sausage and the duck, bacon and fig housemade sausage. Don&apos;t miss more than 100 craft brews on tap and live music most nights. Where&apos;s your favorite al fresco dining spot? Take a pic and tag it at #trueaustin for a chance to see your shot featured by our team! Photo of Perla&apos;s credit Casey Dunn.